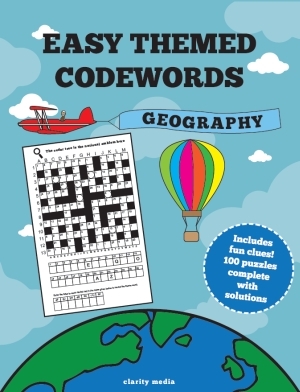 Welcome to this fantastic collection of 100 brand new Easy Codewords, with a geography theme. In addition to the usual codeword, the puzzles in this book have a fun bonus twist: hidden in the circled squares in each grid is a geography-themed word. A clue to the word is given at the top of each puzzle, and the entry grid at the bottom of each puzzle helps you unscramble the letters to find the theme word. - Each puzzle comes with five given letters to help you get started in solving the grid. You may find this enough information to solve the puzzle and simply write out the geography themed answer at the end of the puzzle as a little extra. - Alternatively, you can use the themed word whenever you wish to get a lot more hints about the grid. If you can solve the clue straightaway and write in the themed word, then you will reveal several more letters in the grid to help you make progress solving the codeword. Or you can note down the letters in the circled squares as you go along and solve both elements of the puzzle at the same time. As outlined above, there are a couple of unique elements to these codewords that make them ideal for beginners. First of all, we give you a lot more help to get started, because there are five clue letters given, not the usual two or three. The start of the puzzle is always hardest as you look for more clue letters, so giving five makes a big difference and should ensure you are not left scratching your hard for a long time initially. Secondly the clue, and the clue squares, mean two things: firstly you can simply use the letters to check your answer is correct at the end or as you go along. 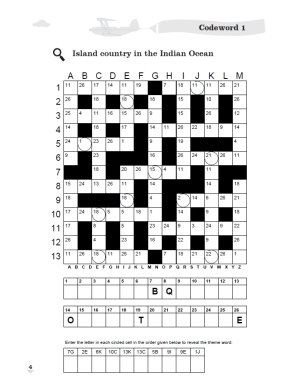 Secondly, if you want to, you can write in the answer letters at any stage should you solve the clue - and most clues are quite straightforward (for instance the capital of a particular country) so you have many more letters there if you need them. We hope you enjoy this novel way of experiencing the codeword puzzles, whether you are a beginner getting into the puzzles for the first time, or an experienced solver looking for a fun and different solving experience with these simpler puzzles to enjoy at your leisure. If you like this book, are there other themes you'd like us to explore in this range? We'd love to hear from you, so please do let us know by contacting us.